Let me tell you about to how to make sure that your infant is getting enough fluoride. Unfortunately, not many parents understand that proper oral care should ideally initiate from the early years of their child’s life. Even before the first teeth start to emerge, there are factors that have an impact on the future appearance and health of a child’s teeth. As baby teeth typically start emerging when they are 6 months old, standard oral health processes such as flossing and brushing are certainly not a required practice for infants. 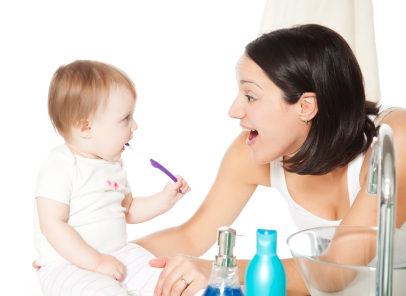 But, infants do have particular oral health requirements that all parents should be well aware of. These needs involve guarding your infant’s teeth against baby bottle decay while ensuring that the infant has enough fluoride. So How Can You Prevent Baby Bottle Decay? Baby bottle decay is actually a problem that results from recurrent exposure to liquids that contain sugars. Mil, baby formula, and fruit juices are among these liquids that are busy, pooling around the teeth for prolonged periods of time as your infant is asleep. As a result, there is a development of cavities in the upper and lower front teeth. Therefore, it is your job to make sure that your baby doesn’t fall asleep with a bottle of milk or juice in his mouth. A better approach would be giving your child a water bottle at naptime. If you are a breast-feeding mother, avoid allowing the baby to nurse uninterruptedly. After each feed, make sure that the baby’s teeth and gums are wiped with a clean, damp gauze pad or washcloth. How To Make Sure That the Infant is getting Enough Fluoride? Fluoride has numerous benefits for your child’s oral health even before his teeth have begun to erupt. Fluoride plays an important role in strengthening the tooth enamel while the teeth are developing. In several municipal water supplies, the authorities add adequate amounts of fluoride to ensure proper tooth development. For finding out whether the water has enough fluoride, consider calling your local water district. If you are using bottled water for cooking and drinking, make sure that you tell your dentist at Brighton Implant Clinic about it in order to get helpful advice on the issue.